I read this article about the downside of microfibre cloths a few months ago and started looking for a new set of dish cloths that I feel comfortable using. Microfibre is out, there are some water problems with cotton as well, so I rediscovered the knitting hemp I had in my stash. Last night at midnight, I started knitting a new set of diagonal kitchen cloths while I watched cooking videos. I thought the hemp would be stiff but it's easy to knit with. I love that the dishcloths won't stretch out sideways. My hemp is from EcoYarns and it's a better choice for me. Hemp lasts a long time, it will not shrink, stretch, fade or pill, and it gets softer after each wash. According to the EcoYarns site, "Hemp is environmentally friendly as hemp production needs no herbicides or pesticides, has low water requirements, produces 2 – 4 times more fibre per area than other sources and maintains a healthy microbial life in the soil. Hemp is naturally resistant to damp, mould, bacteria, moths and silverfish. 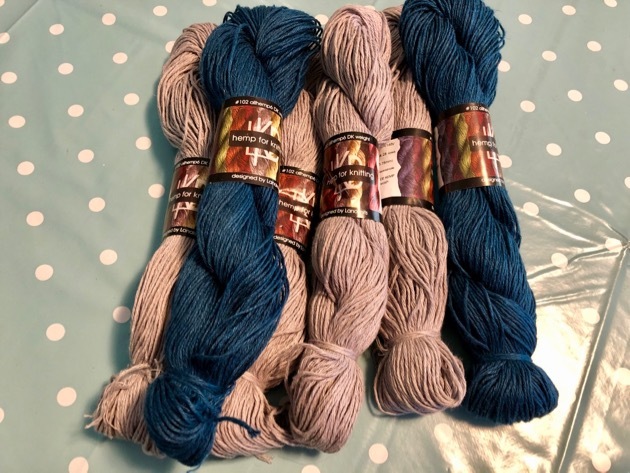 I have proudly had EcoYarns as one of my blog sponsors for many years. I'm halfway through my first cloth, I'll knit four or five and that should set me up for the year. I'll continue to use the microfibre and cotton rags I have for household cleaning and will throw out the microfibre when they're completely worn out; I'll never buy them again. I'll add the old cotton cloths to the compost heap to decompose and be reused in the garden. My other craft project at the moment is editing the embroidery on a cushion cover that Tricia made me. 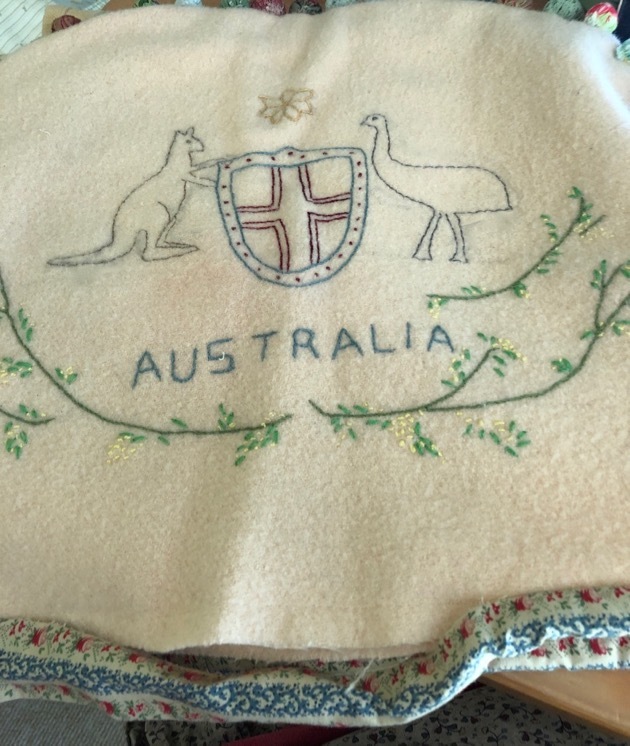 She used an old woollen blanket and stitched on the Australian Coat of Arms. I didn't like the way the kangaroo and emu looked so I unpicked and restitched them. (I told Tricia I was doing it and she was fine with it.) She's made a few of these Australian Coat of Arms projects - usually as tea cosies, and I've loved them since I saw the first one she did. I really like the little balls she stitched along the edge. They're a great way to recycle little bits of cloth leftovers. She bundles up a small amount of fabric, encases it in a piece of cloth and stitches it up like a little sack. Then they just need to be stitched onto the project. They give more character than pom-pom fringe and you can use up all those little scraps you usually throw out. I've been meaning to let you know about my new sewing machine. I'm not sure now if I told you about buying an Elna 40 a few months ago but since then I've been sewing up a storm. I LOVE the new machine. There is a slider to decrease or increase the speed of the machine so I slipped it right back to slow and taught Jamie how to machine sew, as well as hand stitch. Every element on the machine, except the automatic needle threader, work extremely well. I've given up on the needle threader but I'm good at threading needles so it doesn't bother me. The stitches are firm and even, the needles always finishes above the fabric when I stop and even when I did some shirring, which I'd never done before, it worked perfectly. It's a great machine and it only cost about $300, I forget the exact price. Jamie's just gone home so when I finish this post I'll get back to my craft projects while I watch The Kimberly Cruise (slow TV) on SBS. We had chicken with coleslaw and salad for lunch and we'll just have a small snack later so it's all systems go for my stitching and knitting. I hope you're enjoying the weekend and doing something you love. I had no idea there were issues with microfibre cloths, I don’t own any anyway, but I’ll be sure not to buy them now. Rhonda I told my husband about the Kimberley Cruise Show and the one about the Ghan on SBS and he took a look at the cruise one today and couldn't believe anyone would sit and watch that for hours LOL! I told him that I had read the reviews and some people really loved the shows. He couldn't believe it! I had heard about the amount of water used in the cotton industry and about the problem with microfibre cloths so never did buy them. I will check out the prices of the hemp for when I have used up my cotton yarn. Thanks for the info. Chel, tell him that early on in slow TV there were two I remember - one was a fire burning for 8 hours and another of a group of people knitting. You don't just sit down and watch, you watch, then get up and do things, you sew and knit and talk. It's not staring goggle-eyed at the tube. Happy weekend. Glad you are enjoying your new sewing machine. Great to hear about the hemp. My automatic needle threader is a right pain, causing me to get very het up but it’s the only way I can thread so have to persevere. It's great to have time for crafting and creating - how wonderful that you are teaching Jamie sewing skills. Rhonda thank you for the heads up on the cotton. I cant tell you how wonderful it is to have you back blogging again. You may interested in an Australian couple who have a channel called fruity knitting. They do lots of tutorials for beginner knitters but Andrea in particular is a very advanced knitter. It's absolutely fabulous. Yes, I've seen fruity knitting. It's great. I love the way the hemp knits up. It looks so soft. I didn't realise there was a problem with micro-fibre cloths, thank you for drawing that to our attention. Those little balls are a great idea for an edging. How clever of Tricia. I will have to remember this in the future, it is a fantastic way to use up little pieces of scrap. 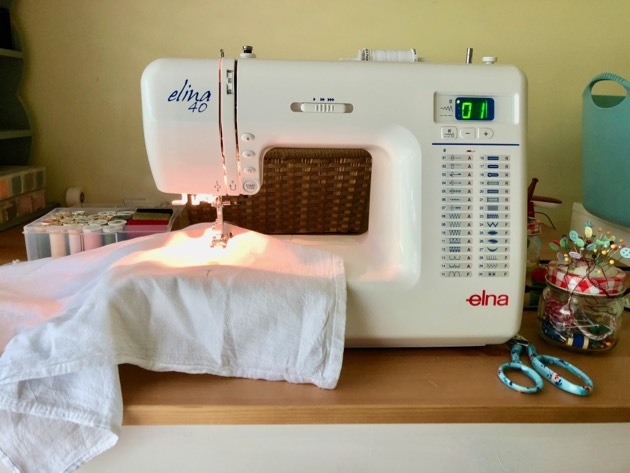 My first sewing machine was an Elna. Mum bought it for me when I was still at school and doing home economics. I was a very keen sewer in my younger years, and still am. My latest machine is an Elna just like yours, still on my "L's" with it though. Rhonda, what is the water problem with cotton? That is all I use. I threw out all of my microfiber years ago, when I notice a weird film on my kitchen towels and dish rags after washing them all together. I've been wanting to try hemp, thank you for suggesting this yarn. Hi Lori, cotton is a crop highly dependent on water and insecticide. However, there are some cotton crops that aren't as bad as other and it's worthwhile looking around for yarn you're happy to use. Look for organic or fair trade. The organic cotton at EcoYarns is better than most. Check it out on their site - the link is on my side bar. I love reading about your day--it brings me such peace, and inspires me to do better. We're in the process of moving house, and I'm going through cleaning supplies today, clearing out worn out or used up items. Your reminder about microfiber is timely! I'm going to read about the microfiber cloths. I only have a couple, which I rarely use, but hadn't heard anything. I love the cushion cover project. 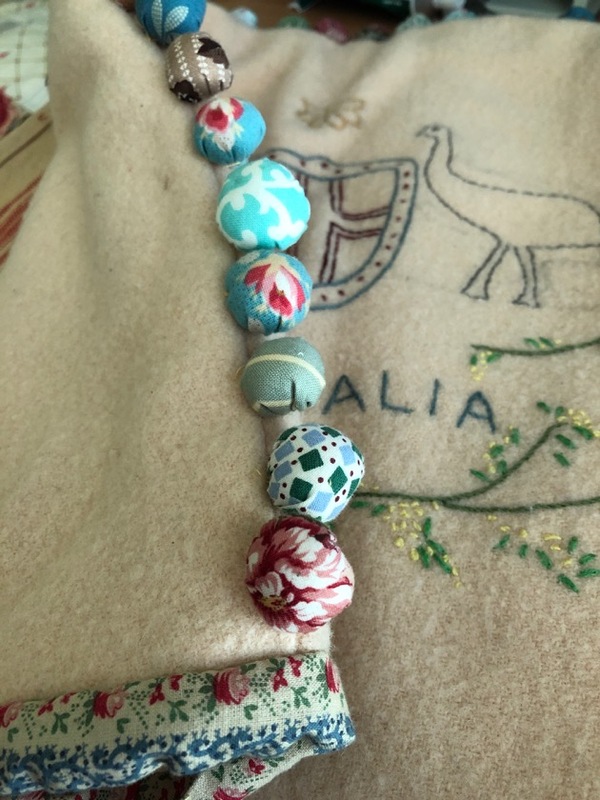 Really love the mix of wool and fabric, and the little ball edging is a great idea and so cute. Hi Rhonda, Your crafts look lovely. I will have to learn to use my sewing machine for other projects one of these days. I have only made some curtains and several flannel tp wipes with it. It's from the 1950's, and is a Singer Featherweight. I love the look. It's great that Jamie has a master teacher as his grandma. You are teaching him so many things! Tricia's cloth balls are a great idea Rhonda. Thank you for sharing the knitting pattern. I have been doing a lot of writing, crochet, hand-sewing and book reading the last couple of weeks which has caused a slight injury with my hand, most likely tenosynovitis. So I am currently alternating between wearing a hand splint (the glove type) and a thumb splint and have started icing the injury as well as resting the hand. Once my hand has improved and I return to crafting, reading and writing I will need to be a bit more mindful about how long I am performing these activities without taking a break. I have a Janome that is a few years old now and the needle threader no longer likes me either. For some reason I never took to microfibre, not sure why. This hemp fibre is quite exciting but knitting at midnight - LOL. I've been meaning to watch the Ghan movie for ages. A friend is watching the 30(? )-hour version in stages. It's funny what we do with our time these days. Trisha's pom-poms are adorable and so do-able. And good on Jamie for giving all these domestic sciences a go! That is so interesting about the hemp. We grow garlic and turmeric to supply Brisbane markets. We haven't had rain in 6 months and we are all worried about continuing to grow garlic. This gave me the idea of growing hemp as much less water is needed. Thanks Rhonda! Hello Rhonda I don't usually comment on your blog. This is new to me but I just had to tell you I was so pleased to see you writing again I hope all is well. I have followed you for years and visited you each time you came to Bathurst. You have made a big difference to our lives and your ideas have helped so much. I have started reading "The Simple Home " again and I want this year to be a reinventing of my life. Thank you for everything hope you and Hanno are both well. Janmar. I'm pleased to be back, Janmar. It's renewed my energy. I was just talking to my sister who rang while she was driving through Bathurst. She's been at her son's place at Blayney and is going back to Blackheath. Beautiful area you all live in. It's a beautiful yarn to knit with, Pauline. I can't wait to wash it and develop that softness that comes with washing and age. Congratulations Rhonda, you have achieved something my mother, grandmother and the Nuns in Home Economics tried and failed. I for some amazing reason have a strong desire to actually knit thoses Hemp cloths, me knit,I use to hide in the girls toilets to miss all sewing classes, appearing for all the cooking. thank you. Like you Kamryn, I went to a convent school and my mother taught sewing there. I bunked out of all of it too and got my mother to do my sewing homework (which she later marked). 👹 Give hemp a go. It's lovely to knit with and it ages much better than wool or cotton. The pattern I put in the post is the most simple knitting there is and an excellent way to start. Let me know how you get on. My place of employment likes to microfibre. But for me I like the crochet cotton dish cloth or maybe I just like making them. I've start to make some quilt blocks. Rhonda, I loved seeing the hemp yarn wrapped around the toilet roll - is this the yarn you mentioned you were trying to unravel the knots out of in a previous post? That colour is gorgeous. Once I run out of my current cotton yarn stash I'll definitely have to try the hemp for dishcloths. Been reading about hemp as a building material too - hempcrete - what an amazing plant. I've been knitting baby hats with Ecoyarn's organic cotton which is lovely. Small light projects only for me in this heat! I love the Coat of Arms embroidery - ideal for Australia Day coming up. 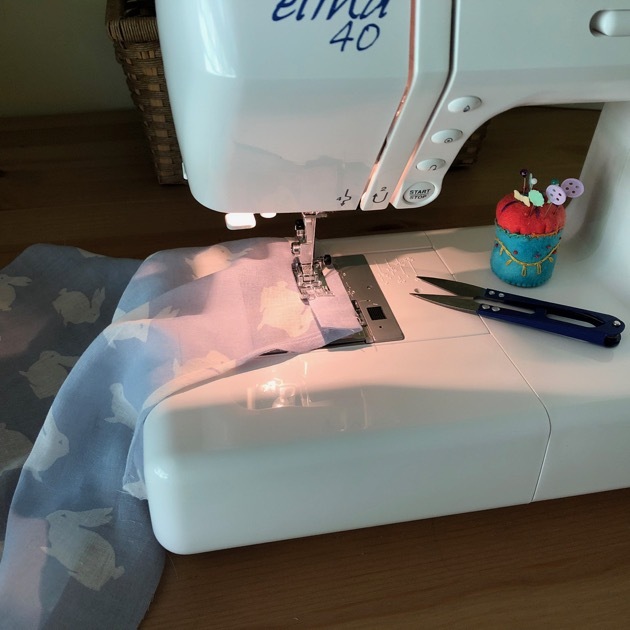 I have taught my two granddaughters to sew on my Janome with the slow, medium and fast speed settings, just like your Elna - best thing since sliced bread for little learners! And like everyone else, I have given away the automatic threader as a bad joke!! I have started my annual read through The Simple Home - my favourite book. Thank you so much for the tips about using hemp. Your blog post years ago alerted me to the problems with microfibre cloths ( I was so sad having moving away from disposables to reusable microfibre cloths). I still have the same microfibre cloths and will use them until they are done, but I am getting my mum to knit me some new dish cloths so I will buy some hemp yarn for her to use. You are always a source of so much helpful information...thank you thank you!! Thanks for a good simple pattern to follow for a novice like me. I have just crocheted a washcloth for my daughter and plan to do few more. When the cotton is used up I will buy some hemp yarn to try. It sounds lovely. The advice to do the cloths on a diagonal is really useful. Thanks again. 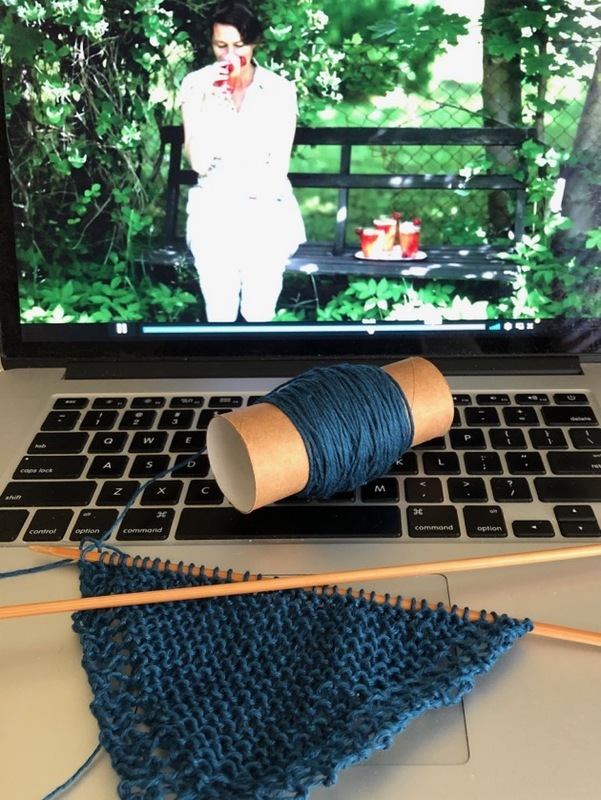 I have been thinking about learning to knit for a long time, and maybe this is where I start. A question about the yarn. I found an ebay auction for hemp yarn. It's a foreign language to me. From the pictures, it looks like the same brand you use. The listing says "all hemp 3 and all hemp 6" I don't see any ply labeled as the seller has the skein positioned so you can read the color. I can read something about gauge: 28 stitch and 38 (something). 3mm needles (US 2). LOL! Maybe I should stick to sewing! Hi Rhonda. Could you tell me what size your dishcloths are? In our house the jury is out on the best size. Hi Rhonda. I love the idea of replacing cotton with hemp. I am wondering how many cloths you would get from one hank, using this pattern and to the size you make. I've only knitted one so far, Meg. I haven't quite finished untangling the yarn yet but from what I can see with the yarn I have wound, I think I'll get two, maybe two and a half. The one I made was a 55 stitch when I started decreasing. I'm using the first one now and it's fabulous, very absorbent and a good wiper. I used to have trouble with my auto needle threader. Then read that you have to have the foot down. I find it works fine now that I know that. I love knitting this pattern - I've found that I prefer the looser weave provided by using a size 10 needle rather than 8. My 8's and 9's were occupied recently and I was itchin to make a dishcloth ;)...so I used the 10's and was so happy with the size. I stop at 45 stitches. I'm curious, though, about the cotton issue. Will have to research. I've only been using cotton for my dishcloths. Your embroidery always inspires me! I'm glad you love your new machine, Rhonda. I still have the first machine I ever bought (in 2000 when I was pregnant with my first child). It is a Janome and still works really well but I have wondered about how hard it would be to buy a machine without being able to test it out. I used a basic Singer at a Boomerang Bag sewing day one it was really awful. I'm glad yours is just right for you. Thank you for the information on the help yarn. The automatic bobbin threadder was my fave feature on my new Brother Innovis. The fights i used to have with my old machine constantly losing the bobbin thread or losing the tension and getting all bunched up. Im currently trying to convince my mother to get a new machine as hers is nearly 30yrs old!